Adjusting to hearing loss can give you a sense of victory, particularly when you overcome a situation that pops up in your daily routine. For people with hearing loss, visual cues are really important. Eye contact is key, especially if you rely on lip-reading. If you don’t already lip-read, you may want to sign up for a class or check out the fact sheet, Learning to Lipread, which is available from the Action on Hearing Loss website. 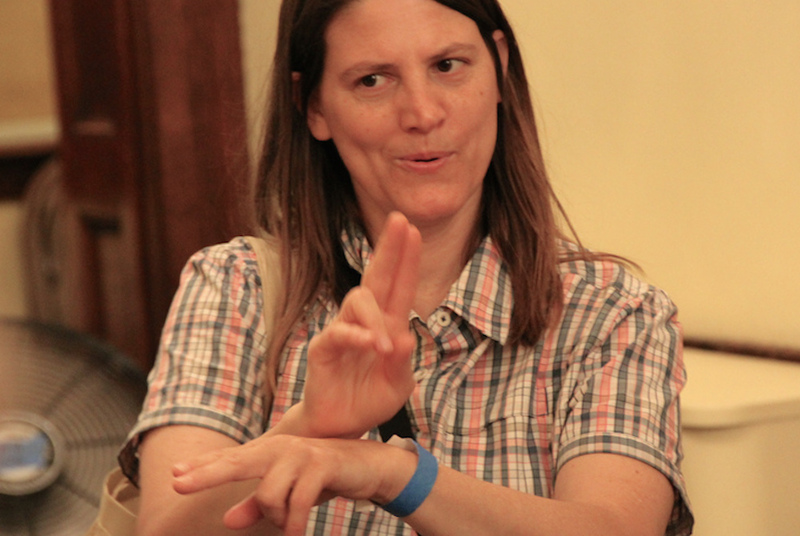 Sign language is another helpful form of communication if you have hearing loss. British Sign Language (BSL) is the first or preferred language of around 125,000 adults who are deaf in the UK. Fingerspelling is another term for the BSL alphabet, but there is much more to BSL than just the ABCs. For instance, did you know there is a guide to signs specifically related to Jewish culture? You can order Sign Language in Judaism if you want to find out about the signs used by the British Jewish deaf community. Jewish Deaf Multimedia also has a Jewish terms glossary with video demonstrations on its YouTube page, but those signs are based on American Sign Language, not BSL. Whether you wear hearing aids, read lips, use BSL or rely on any combination of these methods, your best chats will happen when you can speak face to face with someone and stand about three to six feet apart. Remind the other person to turn directly towards you and look you straight in the eye. Ask them to speak slowly and clearly in full sentences, have them repeat what they have to say (but no shouting, please!) or get them to write things down if all else fails. Be responsive and encourage others to do the same; body language and gestures are another great way to express ideas. Some communication suggestions are just a matter of common sense. If there are several people talking together, remind everyone that it’s better if they take turns. This also means they should not start a conversation with you and then walk out of the room. And yes, it’s okay to ask them to put down their mobile phone so you can maintain better eye contact when you chat. Ideally, try to find a quiet place where there aren’t so many noises or distractions. If you’re in a public space with lots of people, look for a well lit corner—your best bet is a spot where the light falls directly on the faces of the other people in the conversation. If you’re in a restaurant, try to stay away from the kitchen where the hustle and bustle can be both noisy and distracting. And if you’re in a place where there’s background music, don’t be shy about asking to have it turned down. Using the telephone can be a great way to stay in touch and keep your independence. Fortunately, there are special accessories that can help you use your telephones, textphones and mobile phones. You can continue using your traditional landline phone with a few simple adaptations. The easiest thing to do is to turn your ringer up and put your phone on a hard surface; that’s a quick way to get the most out of your phone and best of all, it’s free! Visual call indicators to flash when the phone rings. If you’re a hearing aid user, look for phones that have an inductive coupler that supports the hearing loop setting. When it’s set correctly, the inductive coupler can work with your hearing aids to shut out pesky background noises during your call. A textphone allows you to use a keyboard to type in messages and display them on a screen. If you’re using your textphone to chat with someone who doesn’t have a textphone, Next Generation Text (NGT) service (formerly known as BT Text Relay, TextDirect or Typetalk) is a free way to send your message to a regular voice telephone. This text-to-voice and voice-to-text relay service uses an operator to convert text into different formats. But don’t worry about snoopers; the text operator will not be part of your phone call. NGT service uses your computer, tablet or smart mobile device to make text calls. All you need is the free NGT Lite app, which is available to download from the NGT service website. This app lets you speak and read at the same time, so conversations flow naturally. As mobile phones become more commonplace, these devices can be especially helpful for people with hearing loss. Older phones used to generate radio frequencies that made buzzing sounds that could interfere with hearing aids; modern low interference models have worked to resolve this issue. Hearing aid settings can help you get more from your mobile phone, since their T (hearing loop) and M (microphone) ratings can help you pick out what works best with your mobile phone. Ratings for both categories range from 1 (poor) to 4 (excellent), but unfortunately, some mobile phone manufacturers still don’t use T and M ratings. Neckloops and ear hooks can be helpful if interference is still a problem, and they work with most hearing aids that have a hearing loop setting. Hands-free kits can also help cut down on interference. All three—neckloops, ear hooks and hands-free kits—are available with Bluetooth wireless technology. The speakerphone option on most mobile phones can be convenient, but it also means anyone and everyone can hear both sides of the conversation. And if you have the volume turned all the way up, the call could sound distorted. Other apps like Skype or Facetime make it possible for you to communicate on your mobile phone or computer—as long as you have a microphone and a decent web camera. If you have an Internet connection that’s fast and reliable, you can use these apps when you want to lip-read or use sign language to communicate. You can also use the chat box on these apps to type in text if your webcam is down or your connection is slow. In a practical sense, just make sure you have at least two different types of telephones—don’t rely strictly on only one kind of technology. Cordless landline phones may be convenient, but they won’t work during power cuts; mobile phones are great as long as they have fully charged batteries and your service is reliable. Finally, if you’re thinking about buying a new phone and still have questions, check out some of the pointers in this article, "Dos and Don’ts when buying a phone for the deaf and hard of hearing". While a missed phone call can usually be recorded on your answering machine, there is no such thing as an answering machine for your front door. However, there are doorbells that are extra loud; there are also some that use flashing lights or vibrations to create additional alerts. Some of these devices are battery operated, which means they are so portable you can take them with you as you move in and out of the house. It’s also possible to get transmission devices that send specific signals to a pager that is attached to your clothing. Whether you’re upstairs or out in the garden, you won’t miss another visitor or delivery person who rings your front doorbell. View panels or side windows at the front door can be more helpful than a typical peephole to identify visitors. However, make sure they are installed far enough away from the lock so they don’t provide easy access for burglars. There are two different TV access services that can help you keep up with the latest television shows and films. Subtitles are transcriptions that appear on screen during a film or television broadcast. Most TV remote controls have a button marked "subtitles"—all you have to do is press that button and they’ll appear (as long as the programme you’re watching has been captioned). BBC iPlayer has subtitles on every programme. More than half of the programmes on ITV Player, 4oD and Demand 5 have subtitles available. Most streaming services like Netflix, Amazon Prime Instant Video and LoveFilm offer subtitles too these days, so you should have no problems if you’re watching a film or programme—whether it’s a DVD or something you stream online. The BBC website has a dedicated "Signed" area on its iPlayer, which showcases signed programmes. The BBC also has BBC Two See Hear, a weekly magazine programme for people with hearing loss. The programme covers education, rights for people with hearing impairments, technology and language and is presented entirely in BSL; it is also broadcast with subtitles in English. The British Sign Language Broadcasting Trust (BSLBT) has created a collection of programmes—made by deaf people for deaf people—using BSL. All of these shows are available to watch on the BSL Zone Player, and they range from chat shows and documentaries to comedies and dramas. Television listeners are devices that allow you to watch television with the help of headphones, loop systems or personal amplifiers. Many of these devices are wireless, which means you won’t have to deal with messy connections or trip hazards. Action for Hearing Loss has a helpful description that explains the benefits of these different TV listening options. Cooking is one of those experiences that taps into all of your senses—from smell and taste to sight, touch and even sound. In the most practical terms, sounds associated with alarms, bells and timers can make all the difference for the chef who may want to multitask away from the cooker. There are portable timers that vibrate or flash when they go off, so you can carry them around with you to let you know when the water has boiled or the pot roast is ready. There are even wristwatches that can be used as cooking timers when they’re not being used as alarm clocks, just in case you want to have a quick snooze while your slow cooker simmers. There are several things you can do to make life around the house safer to navigate and easier to manage. A control device will link all of the other components together. This can be wired or wireless and can be powered by mains, but it should be backed up by battery power. If you wear hearing aids, soft furniture and carpeting can make a huge difference when it comes to managing background noise. You’ll also want to create open sight lines throughout your floor plan; this will make it easier for you to lip-read or sign with others in the house. Look for lighting that supports lip-reading or signing; mirrors can create glare and reflections, and shadows can make it tricky to see what other people are saying. If you are deaf or have severe hearing loss, your local social services or councils may help with the costs of some of these adaptations for your home (particularly when it comes to fire safety equipment like smoke alarms and detectors). Contact your council or borough to find out about making home adaptations, or in Northern Ireland, visit the Housing Executive website and check out the housing benefits and grants section. Hearing dogs are provided to deaf people at no charge, and each puppy is trained and socialised to meet your specific needs. These dogs cannot only help you adapt to independent living around your home, they’re great companions, too. For more information on hearing dogs, visit Hearing Dogs for Deaf People website.